Brie Oakley, the nation's best girls cross country runner, started running competitively 17 months ago - Denverite, the Denver site! Her dad signed her up for a 10K in Boulder. He pushed her to run harder when he realized she was bored — and he didn’t see her until the finish. Feb. 14, 2017, 6:23 a.m. The first time Mike Oakley realized his daughter, Brie, might be a special runner was when she left him in the dust as a 9-year-old at a race in Boulder. Brie didn’t run races often back then. Soccer took up most of her time. But once or twice a year, Mike, a high-school cross country runner who still competed in road races, signed her up. The plan for Mike and Brie that day was to run together. Brie had never completed a race that lasted longer than 3 miles; the event Mike signed them up for was the Bolder Boulder 10K, which comes out to about 6.2 miles. “I run at a pretty slow pace. I didn’t know what the pace was. I just thought, ‘There are 50,000 people here. You’re 9 years old. Just stay with me,'” Mike says. “About halfway through I could tell she was absolutely bored. So I said, ‘Make me catch you.’ And she went whooooosh. Nine years later, Brie, a senior at Grandview High School in Aurora, is considered by many the top high school girls cross country runner in the nation. In October, she won the class 5A individual state championship with a course-record 17:07.83. Then in December, she won first at the Nike Cross Country national championships in Portland, Oregon. She finished 28 seconds ahead of the runner up. Last month, she was named the Gatorade National Girls Cross Country Runner of the Year. 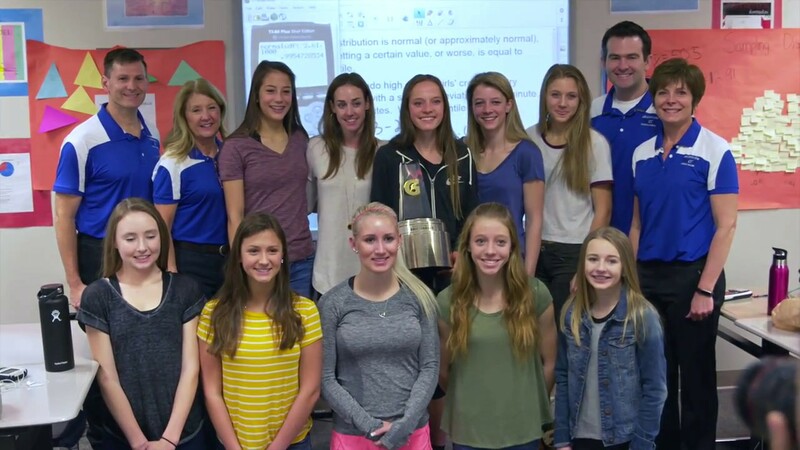 Olympic long distance runner Molly Huddle presented her during statistics class. Although Oakley ran a handful of races with her father for fun when she was younger, she didn’t begin running competitively until 17 months ago. One of Oakley’s friends, a fellow soccer player who was also in her math class, convinced her to give cross country a try. She joined at the start of her junior year. Now Brie is nearing the end of her senior year, and she’s won a state title, a national title and has earned a scholarship to run at University of California-Berkeley next year. Brie gave up soccer last year after 12 years of playing the sport. It became too much to handle with track, cross country and schoolwork on her plate. How much she runs fluctuates depending on what part of the season it is. Right now she’s gearing up for the start of track and field season and logging about 45 miles a week. Brie’s parents, Mike and Angie, say they’ve never pressed her to keep up with her running. Brie does it on her own. Asked why she’s taken to the sport so quickly, Brie says she likes how much of an individual pursuit long-distance running is compared to the other sports she’s played.